We are now one of the leading providers of simulated game shooting in northern England. All our instructors have many years of experience of shooting live game in the field and their knowledge is put to full use when we set the traps for a simulated game shoot. Using the latest Morris 'Sporting Six' trap controllers (so called because they can co-ordinate up to six traps simultaneously), we can deliver a truly outstanding sporting challenge. 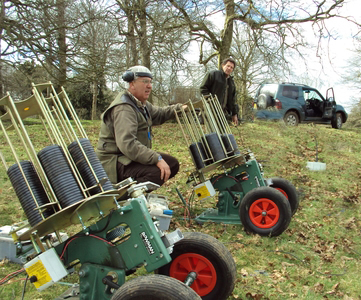 The technology means that the paths of the clays will mimic the flights of your chosen selection of birds superbly, and identical target combinations can be delivered as a set to successive teams of shooters. 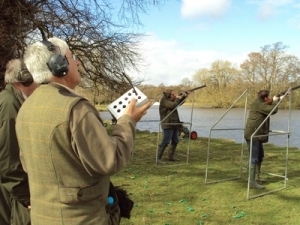 With a scenic backdrop, such as can be found on some of the fine Yorkshire estates and other shooting locations it is our privilege to work with, Simulated Game Shooting can be an excellent substitute for the real thing and an exciting sports challenge in itself. There can surely be few better or more pleasurable ways to ensure your shooting action stays in order during the close season. As well as the more obviously necessary equipment such as a range of suitable guns, shooting cages and cartridges we also provide all the peripherals and accessories (such as ear protection, remote trap controllers, signage and safety fencing) needed to ensure your guests are protected and comfortable. With one of the largest inventories of traps available in the north of England (including some of the latest Bowman models), we can cater for the needs of even the largest events. 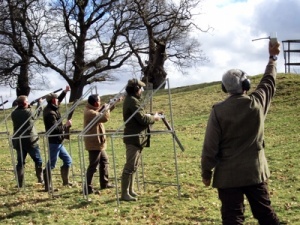 A simulated game day can be organized along the lines of a traditional field shoot, making it an ideal corporate entertainment or social event. With support from our excellent catering suppliers available by arrangement, you will have everything you need to ensure you and your guests enjoy a truly memorable day's shooting. Out of season, simulated game provides one of the best ways to get out to the countryside and enjoy your sport and does, of course, hold one other significant advantage over a live game shoot - you can have almost as much enjoyment, but it is likely to cost you considerably less. Call Erik Aaron Shooting to arrange your own simulated game shoot, or to find out more.